A new Kazakhstan-Azerbaijan Friendship Park is under construction in the city of Aktau, Azertac reported. “Dostlug” National and Cultural Center of Azerbaijanis and Azerbaijan`s Consulate General in Aktau have held a special ceremony to plant trees in the area of the park. Azerbaijani Ambassador to Kazakhstan Rashad Mammadov, Azerbaijan's Consul General in Aktau Elkhan Zeynalov, representatives of Kazakhstan` government, public figures and media representatives attended the event. 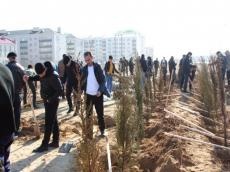 A total of 613 trees were planted in the park to commemorate the victims of Khojaly genocide, committed by the Armenian troops against Azerbaijani civilians in the town of Khojaly. Some 613 civilians mostly women and children were killed in the massacre, and a total of 1,000 people were disabled. Eight families were exterminated, 25 children lost both parents, and 130 children. Azerbaijanis and Kazakhs are both Turkic-speaking people and share close historical, religious and cultural ties. Today, Kazakhstan and Azerbaijan are more interested in intensification of cooperation in other areas, particularly logistics and infrastructure. Necessary measures are taken to better utilize the opportunity driven from the passage of shortest East-West transport corridor through the territories of the countries.